Just to give you an idea for how to get started, I suggest reaching out to an association, employer, membership club, or some other organization who has access to tons of people all at once. Let's say you want to form a deal with Costco. What you do is, you tell them you have this great camp, and you know their membership will soon be looking for summer programs for their kids. Then you tell them you'd like to make a some sort of a special offer to their members and employees, maybe 10% off your slowest camp session, a free coupon to your camp store -- something like that. 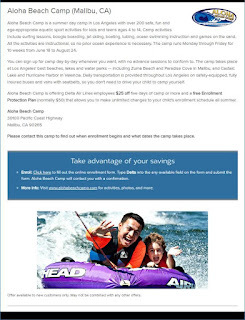 Once you hammer out the details of your arrangement, Costco turns around and emails all their members about this wonderful summer camp they just partnered with. The email includes a link to a special enrollment form you made just for Costco members -- this way you can keep track of who gets the discount, whether the promotion worked, etc. Is forming an strategic alliance with a big company like this really that easy? Does it really work? Yes, it can be that easy, which ther times you might have to contact 50 places or more before you strike up your first joint venture. But I can tell you this -- it CAN and DOES work! The photo above illustrates a joint venture I've been doing with Delta Airlines every year for past 5 years or so. We offer an exclusive discount just for Delta employees, which Delta promotes as an employee benefit. It's been a valuable partnership for both parties, so we decided to renew it again today for another year. The main hurdle you'll face in starting your Joint Venture or partnership program will probably be getting over the fear or intimidation of making that first connection to propose an alliance. Just come up with an offer and start contacting people and places who have access to many other people. It'll work out great for both of you. And once you've established one or two of these, they get easier and easier to set up going forward. It's a smart summer camp marketing strategy, so don't wait. Start a partnership with someone today. You could sign up a bunch of kids at once rather than plugging along registering one at a time.